Yesterday I showed you a crowd that was astonished by "something"... Well, that something was La Petite Géante (the Small Giantess), a huge marionette who walks around the city, looking for a rhino that escaped from Africa and is hidden somewhere in Santiago. This rhino is the author of the accident I showed you here. As you can see, the show was an absolute success! 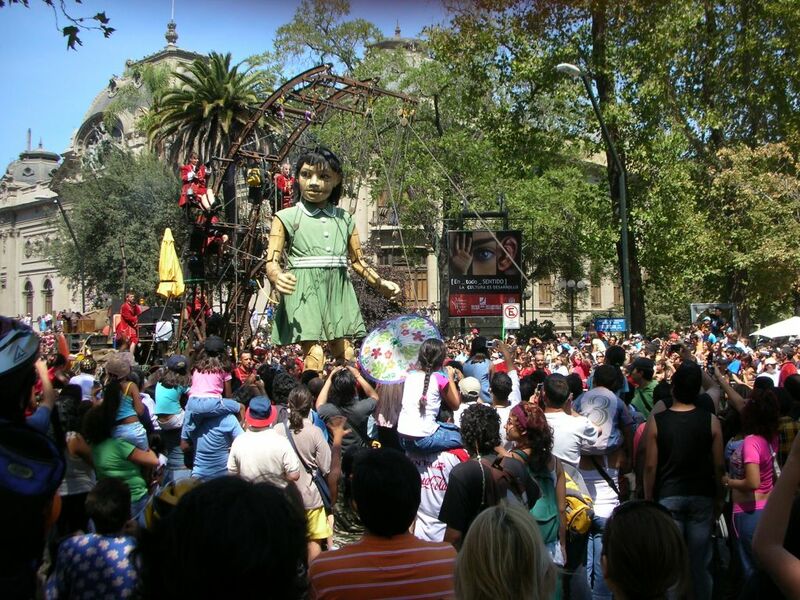 La Petite Géante is a show by the French street theatre company Royal de Luxe and Santiago is the first city outside Europe to receive such a nice visit. Will she ever find the lost rhino? I can understand the excitment in the crowd. That is a huge puppet. After the rhino did so much damage, did she ever find it? le royal de luxe est l'une des plus surprenantes et inventives troupes de 'cirques' en France. Great photo.We had this same puppet with a giant elephant in London last year! I know Royal de Luxe. They came into my city for a week. Their show was wonderful. I took a lot of photos.